Gas ovens are prized by chefs because they heat quickly, efficiently, and consistently. The downside of a gas oven is that gas is highly flammable, and can be fatal when inhaled in large quantities. Fortunately, gas ovens are generally safe. Natural gas in its unmodified state is both odorless and colorless. Gas companies add a chemical to give gas its distinctive rotten-egg smell. If your oven smells like gas, it may indicate a hazardous condition which needs immediate attention. Not all smells are cause for immediate concern, however. 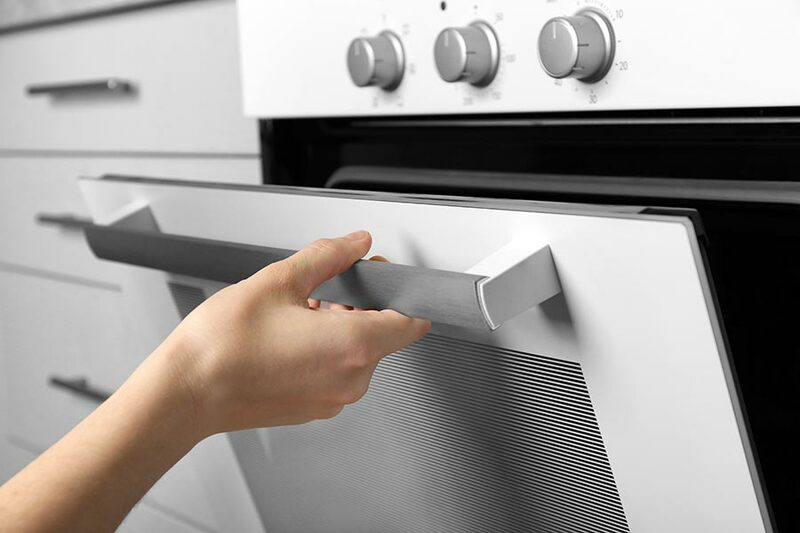 Before using your oven for the first time, thoroughly inspect the internal compartment to ensure there are no leftover packing materials or twist ties. These items are not oven-safe, and leaving them in the oven is a fire hazard. It may also cause a strong burning smell if they are exposed to heat. If you smell something unexpected when you first turn on your oven, ensure all extraneous material has been removed. Even if there is nothing left in your oven, it may emit a strong chemical odor the first time you use it. The smell may be caused by the curing process when the oven is exposed to extreme heat for the first time. Some brands use an insulation that is known to give off strong smells at first use, and other manufacturers use a protective oil coating, which can cause an offensive scent. It is normal to smell a little gas when you first turn the oven on. This is caused by a small amount of gas that is released before it is ignited. The smell should go away after a few minutes. If the gas smell does not dissipate after a few minutes, do not continue use. Turn the oven off, then turn off the gas at the source. Open windows and turn on any available fans. Contact a professional appliance repair service such as It Is Fixed to check for leaks or loose connections. If you feel dizzy, nauseous, or have a headache, leave your home immediately and contact local emergency services. You should never smell natural gas from your appliance when it is not in use. If you do, there is a leak in the system that will need to be repaired as soon as possible. Leave your home immediately. Do not attempt to use an appliance. Once you are safely outside, contact a professional repair service like It Is Fixed Appliance Repair to locate and repair the leak. If you feel dizzy, nauseous, or have a headache, leave your home immediately and contact local emergency services. Have at least one carbon monoxide detector in your kitchen, and on each level of your home. Be familiar with the symptoms of overexposure to natural gas. If you hear a hissing or whistling sound near a gas line, evacuate your home immediately. Know how to turn off the natural gas at its source. Never use a gas oven as an alternate heat source. Do not line the oven with foil or block the oven’s vents. Turn off your gas oven before sleeping or leaving home. Gas ovens should be attended when in use. Never use combustible oven cleaners in a gas oven. Do not attempt to install or repair a gas oven yourself, instead use the services of a trained technician. If you have any questions or need oven repair in Atlanta, or the Metro Atlanta area, It Is Fixed Appliance Repair is happy to help. We offer same day* appointments and free service calls with a repair.